Some very exciting news in my world - I'll be moving to San Francisco this upcoming weekend and starting a new job on Tuesday. There are some websites you go to and they blow you away. thredUP is one of those websites and I'm fortunate enough to have the opportunity to work alongside their team. It's as simple as that. The response I typically receive is so it's Netflix for children's clothing?, which is a good way to describe the service. Kids grow very fast and buying new clothes for every size can be expensive so send in the clothes that don't fit anymore and receive the next size up that does fit. thredUP tailored their website to their demographic. The design is playful, but organized and the UI is intuitive. The color palette is soft and warm while the graphics give off a comfortable and fun experience. Since I'm a front-end engineer, every time I visit a website I try to find all the bells and whistles that a web application might have. I'll click on everything and hover over anything that looks like it could potentially do something. thredUP didn't over engineer their website as the website seems to have just enough features to make the website feel entirely adequate without a sense of being overwhelmed. I don't have a child, but if I did there are some great, addictive features that would have me coming back to the website frequently. First, they have a set of sponsors that supply thredUP with 'Golden Threds'. 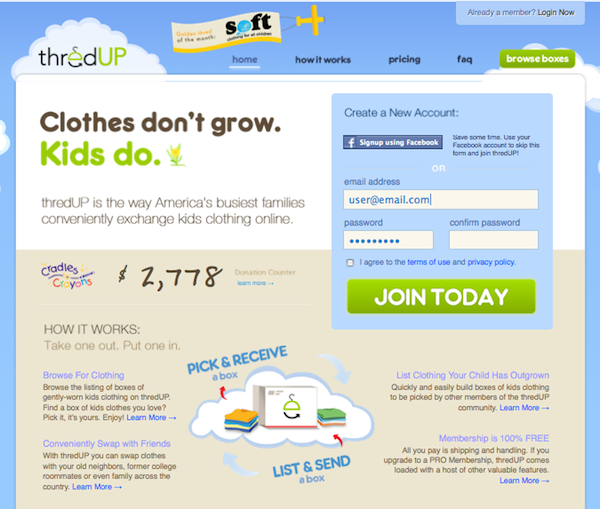 If you're a Pro member of thredUP and you're browsing through the boxes available, one of them could be a 'Golden Thred' that contains brand new children's designer clothing from the sponsor (kind of like a Willy Wonka Golden Ticket). Good exposure for the sponsor and a valuable reward for the user equates to a win-win for thredUP. Another great feature on the website is the socially competitive nature of the rating system. Each box is rated for quality (measured in 'stars') and style (measured in 'stylies')and each user has a rating associated to them that is visible to everyone. 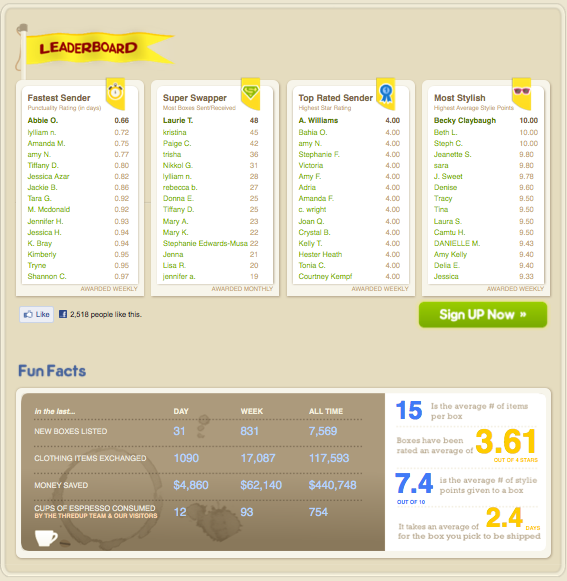 The highest rated users are featured on the leaderboard (shown above) and their boxes are picked faster. Some people are opposed to user leaderboards as it can lead to 'gaming' the system and new users feeling discouraged. It will be interesting to see how this plays out over time.